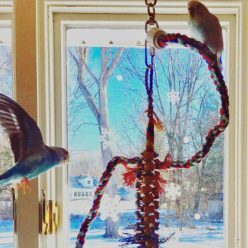 It’s been several months now since my original review of the Super Bird Creations Wind Chimes Toy for Birds and this toy is still Kelly’s number one favorite. Not only that, but it is still in good shape for being abused daily. The toy lost a plastic straw and bead last week when the bottom knot came until, but other than that it looks pretty darn mint. 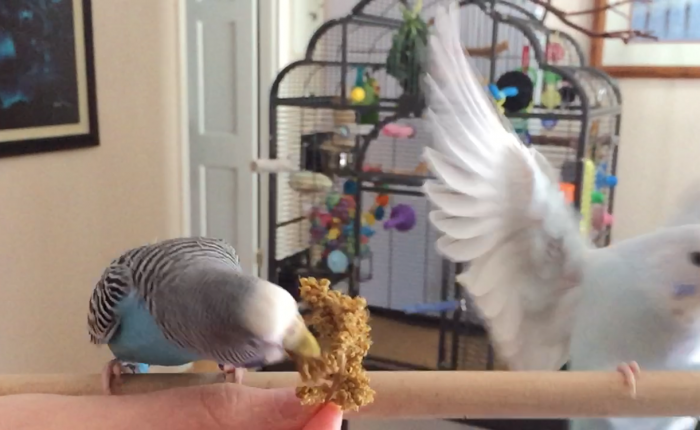 Here’s a video of Kelly being a bat girl with the wind chimes – I wish it was better but she gets very camera shy, you can see she stops playing and rapidly nods her head at me to indicate I should leave her alone! 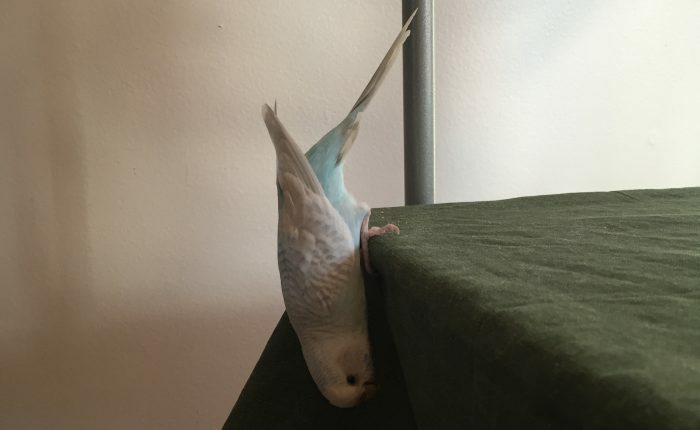 Although Kelly is the primary user, Toby also gets into it, but instead of hanging upside down and twisting around Toby prefers to separate one “leg” at a time and drape it over the nearby perch before dominating. 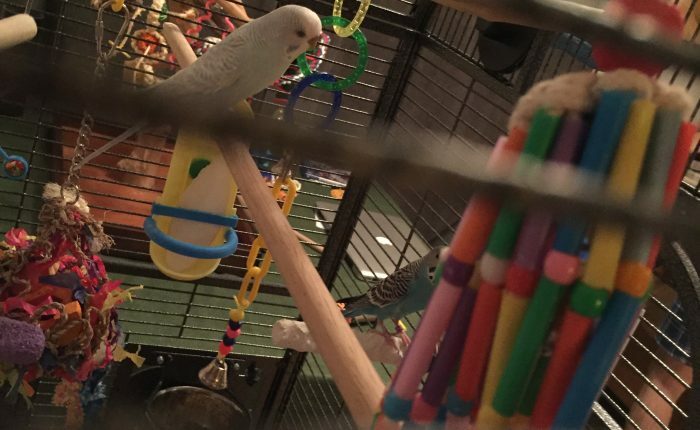 I know that at about $13 it might seem like a pretty big outlay of cash for a single toy, but with budgies it will last you a long time and if yours are like mine it will be the belle of the ball. Video – could you listen to this flock calling parakeet for 2 hours straight? We had a little warm spell recently and it brought a lot of outdoor birds out of their hiding spots to chirp and enjoy the nice days. It has also made Kelly want to communicate with them desperately, so she’s been flock calling to them every morning for hours straight. I know that in a week or so she would realize they aren’t going to talk back and stop trying, but in the interim we have this incessant yelling. Before getting a budgie (or any bird), listen to this on a loop for 2 hours and decide if you can take the noise! Please excuse the weirdly-sized video and the water noise in the background, she stopped yelling as soon as she saw the camera so I had to run the water to get her going again! Format VideoPosted on February 14, 2017 April 12, 2017 Categories Budgie Tips and Tricks, UncategorizedTags basics, flock calling, kelly, noise8 Comments on Video – could you listen to this flock calling parakeet for 2 hours straight?